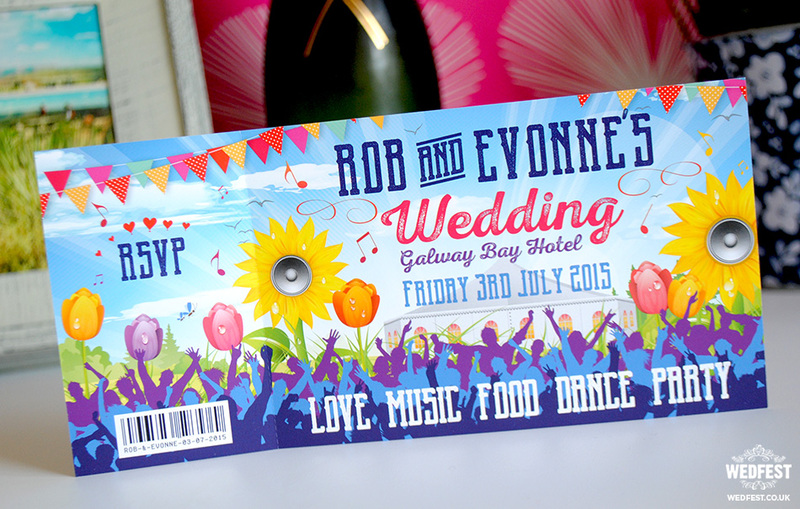 Rob & Evonne’s Festival Wedding in Galway, Ireland – Rob and Evonne got married last summer and to celebrate their big day they decided that since they have a love of live music and music festivals it was only fitting to have a festival themed wedding. 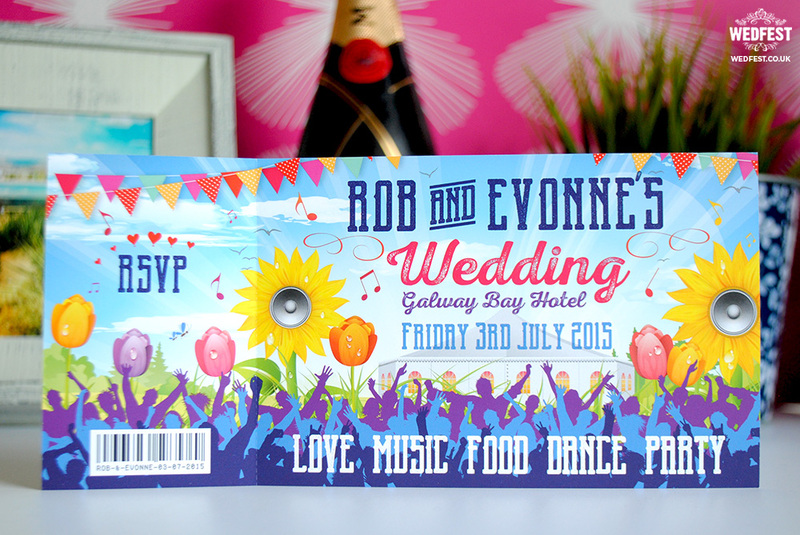 The couple from Galway, Ireland got in touch with Wedfest looking for us to design and make them some amazing festival style wedding stationery for their festival wedding. 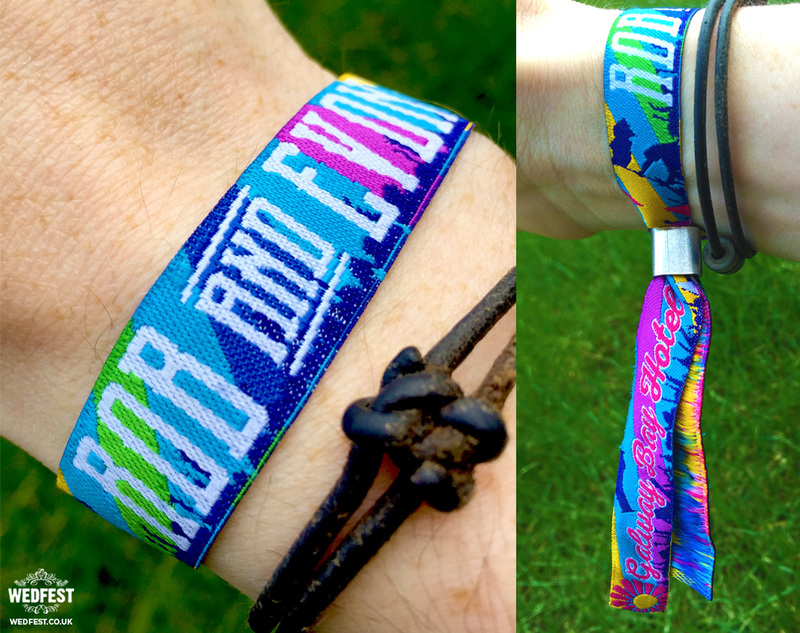 They told us that they loved Electric Picnic Festival in Ireland and went every year. At the time of contact we ourselves had just come back from Electric Picnic and were inspired by the things that we seen. One of the things that stood out was the huge oversized flowers all over the festival site and we had the idea to try and incorporate this into the wedding invitation and stationery design. 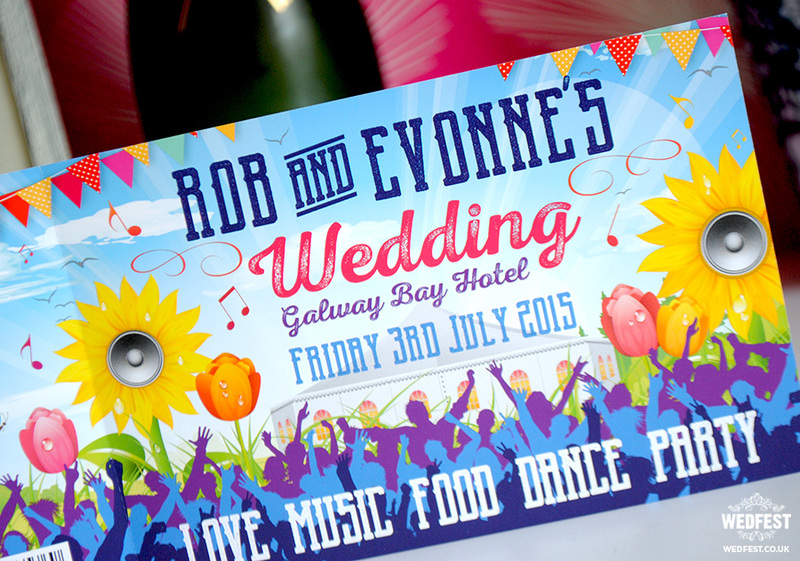 The couple wanted a festival feel for their wedding invitations and wanted to include bunting, musical notes, flowers, and the image of a wedding marquee as this is where their wedding would be held in the grounds of the Galway Bay Hotel in Galway. At the bottom of the wedding invite design and throughout the wedding stationery they wanted large text reading ‘LOVE MUSIC FOOD DANCE PARTY’. The wedding invitation design turned out fabulous and was really bright and colourful with huge sunflowers and tulips adding a blast of summer to the design. We made the wedding invitations in the style of tickets so that the guests could easily tear off the ticket stub which doubled as a wedding rsvp card and easily send it back to the couple in a pre addressed envelope. 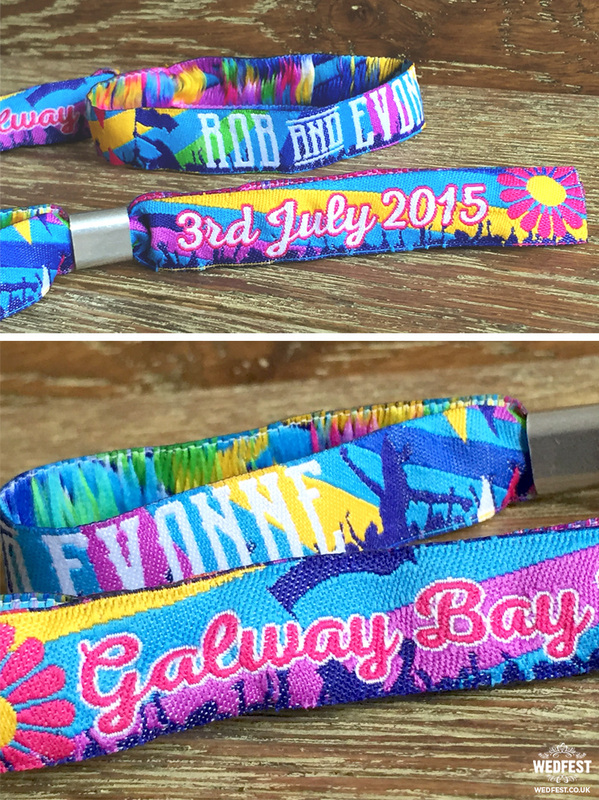 For the wedding day itself we made the couple custom festival wristbands for their wedding favours to their guests. 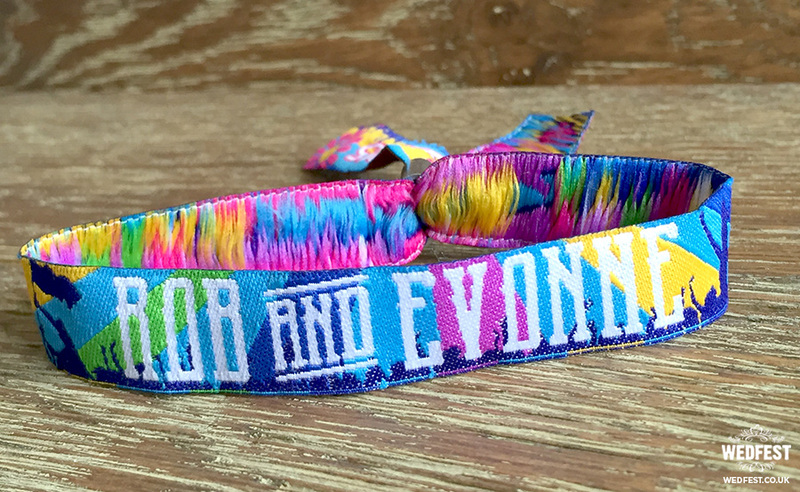 These woven fabric wristbands are just like you would get at any major music festival or event and are a must have for any couple having a festival wedding. 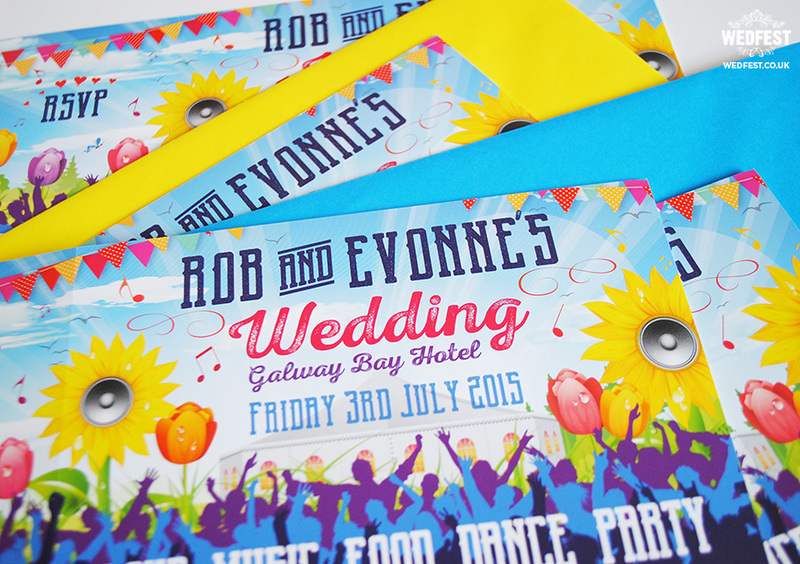 The wedding wristbands followed the same design style and colours from the wedding invitations and included the couples names, their wedding date and the wedding location which was the Galway Bay Hotel. 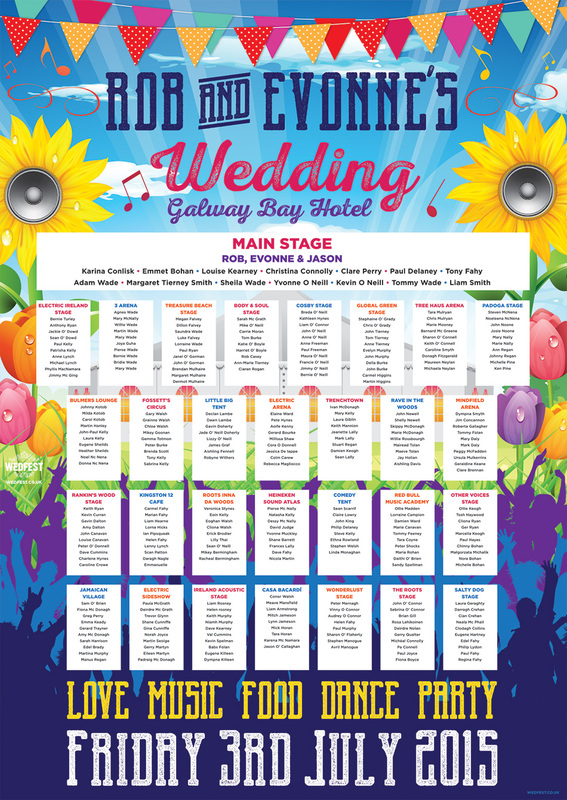 For when the wedding guests arrived at the wedding reception we made the couple a beautiful festival style wedding table plan in the style of a festival line up poster. 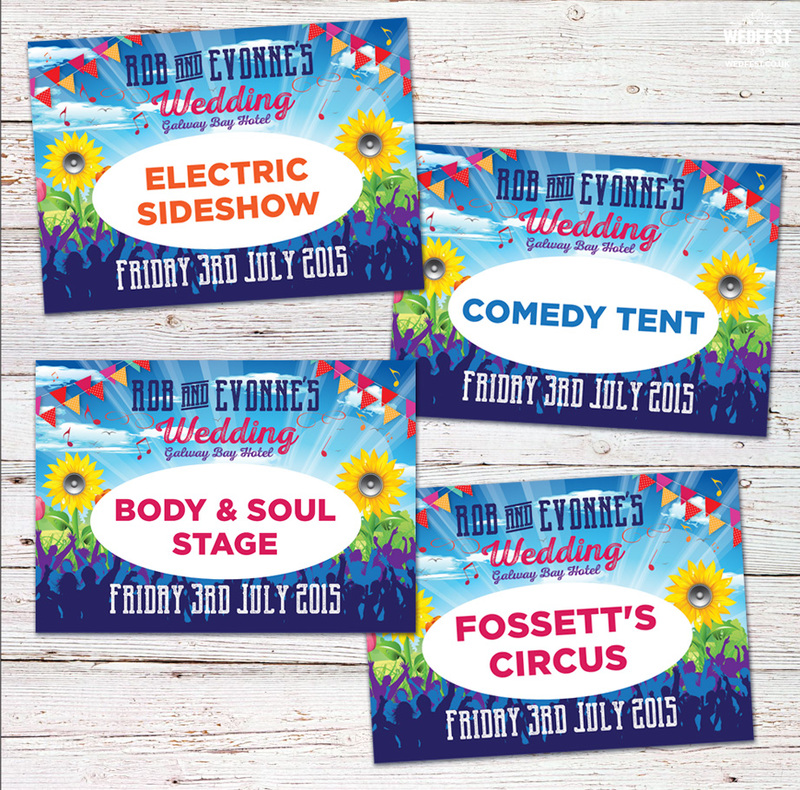 The couple named all of their wedding stages after stage names from Ireland’s Electric Picnic festival. We also then made matching wedding table name cards for each of the tables so guests could easily identify what table to sit at. 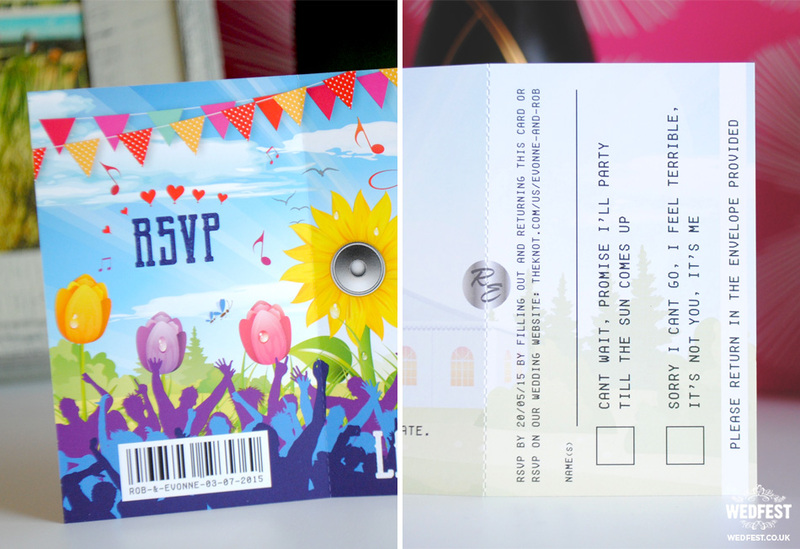 This set of wedding stationery was extremely fun to work on and showcases festival themed wedding stationery at its finest. We were really happy with the results of these designs and are delighted to finally get it all online for everyone to see. 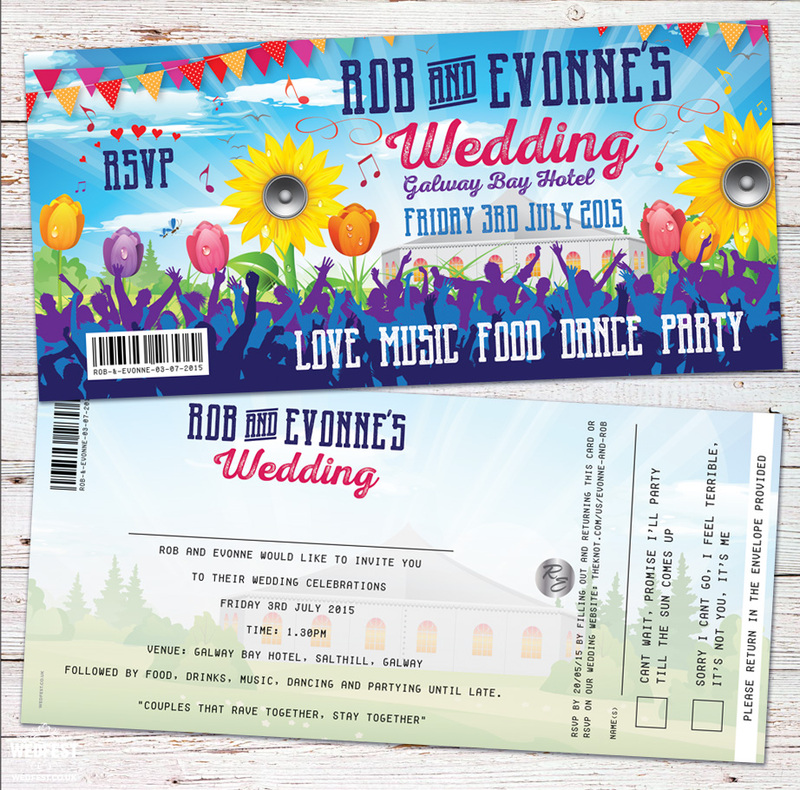 If you like the look of these beautiful festival inspired wedding stationery designs and would like something similar for your own wedding day please click here to get in touch with Wedfest.